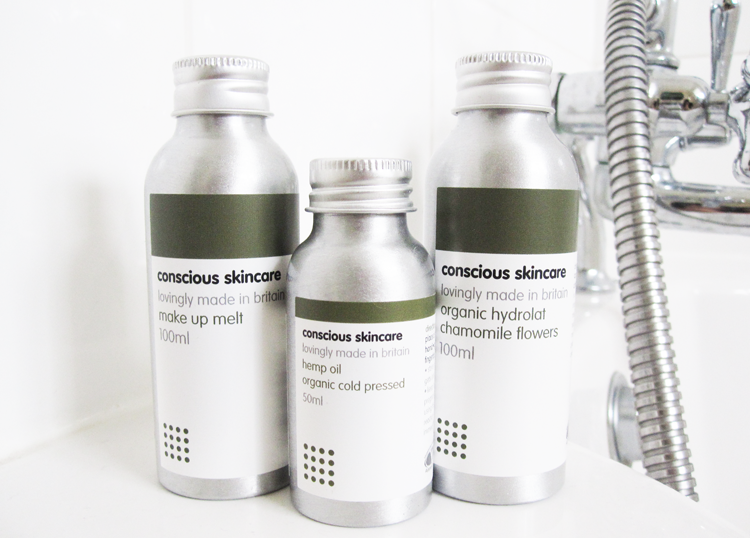 Conscious Skincare are possibly one of the best things to come out of Wales since the Manic Street Preachers and I've had the pleasure of trying out three of their skincare products lately. If you haven't heard of Conscious Skincare before, they are an independent natural and organic company whose products are all handmade in Wales. They use only the best high quality ingredients, are cruelty free (Leaping Bunny certified) and their range is also certified by the Vegetarian Society. In addition to their green philosophy, all of their products are packaged in recycled or recyclable containers and everything is naturally free of parabens, SLS, synthetic colours and fragrances etc. I've reviewed many of their lovely bodycare products before (have a read here), but this is the first time I've given their skincare a go! Make Up Melt is an oil based make-up remover which comes with a handy pump applicator. It's made quite simply with just Organic Cold Pressed Sesame and Castor Oils, and is blended with Grapefruit Seed Extract, Eucalyptus Oil, Myrtle Oil and Rosemary Oil. The cold pressed oils basically break down and remove your make-up, and essential oils help to tone the skin and unclog pores. I was amazed by how well this worked as it removed virtually everything, including waterproof mascara, in one swipe. I just pump a little into my hands, apply to dry skin, add a little water and remove everything with a warm flannel / washcloth. It doesn't feel greasy or leave any residue afterwards which is always a bonus. I love using facial toner mists and spritzers all year round, but they especially come in handy in the summer when the weather starts to heat up. My skin has always gotten on well with Chamomile based products, so I had a feeling I'd like this and I do! This one uses Organic Roman Chamomile and is a great staple product to have in your skincare routine, especially if you have sensitive or easily irritated skin. It helps to calm everything down and gives the skin a wonderfully refreshing boost. Comes with a pump applicator. Hemp Oil is a fantastic multi-purpose natural oil and this one is both organic and cold-pressed. It's full of Essential Fatty Acids and very rich in Omega 3 Oils, so it's beneficial for use on dry skin, both the body and face, to seriously hydrate it. I find this particularly useful for soothing eczema flare ups and I also use it as a scalp treatment and as a leave-in hair oil if my hair's suffered too much blow-drying recently. Like the other products above, this also comes with a pump applicator and a little goes a long way. Have you tried anything from Conscious Skincare?